Because Froggy is away in the Philippines, twelve guest writers will be blogging about anime and/or Christmas. 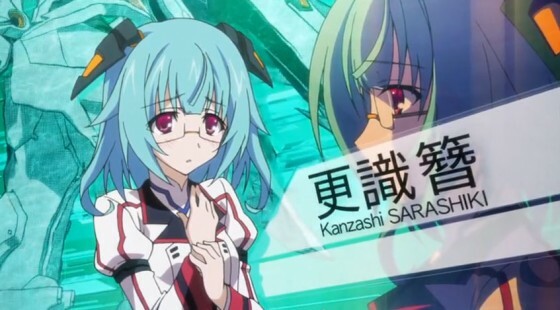 Today’s guest writer is Sarashiki Kanzashi from Infinite Stratos 2, the little sister of Tatenashi and, like every female in the show, is inexplicably attracted to Ichika. Um, hello. My name is Sarashiki Kanzashi. I’m a student of IS Academy and I really like anime. This is my first time writing on an anime blog so please take care of me! I hope I don’t screw up! To be honest, when Froggy-san sent me an email asking me to write a guest post for Fantastic Memes, I was really surprised. I’m a big fan of this blog, but I’ve always been too shy to comment. At school, none of the other girls watch as much anime as I do, so I’ve never really talked about it. But when I met Ichika, I decided I needed to become more upfront about who I am and what I love, so I decided to accept Froggy-san’s offer and write about my favourite anime this season. Ever since I was a little girl I’ve always loved superheroes. Now I realise that superheroes of that sort don’t really exist. We’re just ordinary people, struggling to protect those who we love. Even so, I’ve always believed in justice. I think it is something that is also worth protecting. For that reason, I love watching Samurai Flamenco. To me, Masayoshi-san is an ordinary person who decided to become extraordinary because of his ideals. I think that this is what superheroes are made of. Because of that, Samurai Flamenco is more inspiring to me than any regular superhero show. I also think this anime came at the right time of my life. A year ago, I would probably have thought of it as too boring because Masayoshi-san fights such low-level villains and uses stationery as weapons. How lame! But now I think I understand, because protecting someone isn’t just about how strong you are. Even though my older sister is so much stronger than I am, just once, I was able to save her life. Um, that’s enough of that, though! Anyway, I hope you are watching Samurai Flamenco just like I am and are supporting Masayoshi-san and Goto-san’s fight against King Torture. Jutice will prevail! Fight on, Samurai Flamenco! Ever since the Guillotine Gorilla appeared, I have been watching this anime with bated breath. I’m sorry if you were bored reading my post. I’m not a very good writer, but even so, I really wanted to tell the world why I love this anime so much. Last night, I watched it with my sister, you know, and we’ve gotten closer because of it. I don’t think she really paid attention to all of it, but she liked Flamenco Girl a lot. But still, it was the first time my sister watched the same anime and laughed at the same things I did, which really makes me happy. It has a very universal appeal, I think. It doesn’t matter what happens in Samumenco after the Guillotine Gorilla plot twist, this anime will remain close to my heart forever. (Froggy’s comment: Let me shift the post’s topic away from Samurai Flamenco and discuss what I’ve been doing with these 12 Days posts in general. As I write this, I have no way of knowing how my readers have reacted to what’s already been posted so far, but I’m sure it doesn’t take a genius to work out that this is basically 12 days of fanfiction. We’re already almost done with the 12 days, so perhaps those of you who are keeping up with these posts are starting to appreciate the variety of writing styles that are possible when you start writing “in-character”. Fanfiction is widely regarded as a vulgar art. Among anime bloggers, it’s often used as a form of parody; by deliberately invoking the “cheap erotica” form that’s seen as ubiquitous to fanfiction, what they’re saying is that the anime is so bad you have to actively try to be worse than it. This is basically what the folks at The Classiest Anime do, and it’s also where the humour in draggle’s Sword Art Online fanfiction comes from. I take a different view of fanfiction. I think that by using fiction to comment on fiction, it becomes possible to show levels of insight that are impossible with regular commentary and analysis. If I did not fully understand the anime that I was portraying through my fanfiction, that would be easy to tell because something about it would feel “off”. Thus, a perfectly “in-character” fanfiction displays more of my knowledge about how the characters, themes and setting work together than mere description could ever manage. It’s a very difficult thing to make seem easy. Fanfiction is also a very misleading term in itself because I don’t think you necessarily need to be a fan to write a meta-fiction. For example, I don’t like Infinite Stratos 2, the Monogatari Series, Danganronpa the Animation or Samurai Flamenco (among other anime that aired this year) but I still took the effort to understand them so that I could give justice to them. There’s a distinction between “truth” and “objectivity”, and I think fiction is an art that highlights that more than anything. It’s easier to get trapped in a linear way of thinking about storytelling when you approach criticism solely through expository writing. Basically, if you think like an artist, you will better understand art. Posted on December 23, 2013, in Posts Written By Anime Characters and tagged 12 days of anime, infinite stratos, samurai flamenco. Bookmark the permalink. 3 Comments. You don’t have to worry, the work you have done here is notorious and, plus, it have several POV. I liked this idea. For sure I don’t have all the words I want to post a comment in here, but Anime is better when you can read blogs like yours about it. Awww thanks a lot! I’m blushing! You went here and you didn’t tell me? ?